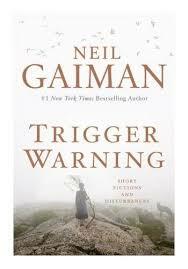 Trigger Warning, published this year, is a collection of short stories or as Neil Gaiman puts it a collection of short fictions and disturbances. Well disturbances because it cuts across various genres, so you have horror, sci-fi, fantasy, fairy tales and even poetry but all of them with the quintessential ‘Gaiman twist’. So what is this book about? Well to quote Gaiman himself ‘we are all wearing masks…These are stories about those masks, and the people we are underneath them’ and I must say he does a great job with it. He starts with ‘Making a Chair’, a simple poem on, well, making a chair, so perhaps we readers can sit back and enjoy the stories. And right when you are comfortably settled, he makes you ‘Run’ through the ‘Lunar Labirinth’ from a warewolf. You have hardly been able to catch your breath when he takes it away with ‘The thing about Cassandra’, and well the thing about Cassandra is that she isn’t, yep, there is no Cassandra! You continue thereafter on ghoulish journey ‘Down to a Sunless Sea’ where you learn that ‘The truth Is a Cave in the Black Mountains’, meet ‘My Last Landlady’ and thank God that you are alive. Then embark upon an ‘Adventure Story’ but make sure you do not buy ‘Orange’ artificial tanning creams ever. If this isn’t enough you also have ‘A Calendar of Tales’ with one story for every month of the year. Here the author gives you a Genie who meets a woman who does not want three wishes because ‘I am good’. A man who struggles with his lonely life in an igloo made of books. A woman who learns to live when she burns away all that was wrong in her life. He also gives us hope ‘So you know it gets better’. Then of course is Sherlock, yes the great detective, taking on Death in ‘The Case of Death and Honey’. He floors us with his tribute to the great author Ray Bradbury ‘The man who forgot Ray Bradbury’, how much do we remember, how much do we forget and lose out on. People, books, stories, possessions, relations, how much do we take with us through life. And while you still feel choked with emotions he gives us ‘Jerusalem’ a take on the famous William Blake poem, about building a better world. Lest you become too comfortable you have ‘Click-Clack the Rattlebag’ to make you jump. So the next time you go baby-sitting, just be careful! There is ‘An Invocation of incuriosity’ which will make you wonder if there are some extraordinary stories in the mundane lives of most people you meet. Then there is the curious case of Obediah Polkinghorn, the uninvertor from ‘And Weep, Like Alexander’, my favorite of the lot. So what do you think Mr. Uninventor would uninvent next? Take a guess. Next comes ‘Nothing O’clock’, imagine if your world was taken over by people who weren’t what you thought they were? Then there a couple of modern day fairy tales ‘Diamonds and Pearls: A fairy Tale’, ‘The return of the Thin White Duke’, ‘Feminine Endings’, ‘Sleeper and the spindle’ . All stories about the unexpected this life is full of. I especially like the ‘Sleeper and the spindle’ which gives an unexpected twist to ‘Sleeping beauty and Snow white and the seven dwarfs’. There is also ‘Relig Odhrain’ on religious fanaticism. What I loved about the stories is that despite being weird and bizarre, there is a definite method to the madness. You could either read them as a simple story, a fantasy, a horror or a fairy tale or choose to interpret it the way you want. Each story could mean so many things and so many different things to different people. He takes the simplest of things, like a ring or memories or a chair for that matter and creates something surreal. He is as adept as describing the humdrum of regular existence as he is when he takes us to the misty islands with such vivid imagery that you could almost see it. 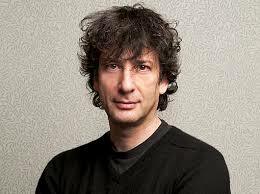 I do not know if this is characteristic of Gaiman’s work [as this is my first Gaiman] but his stories grow on you. For someone who has not read him before or is not into fantasy, might take some time to warm up to it, as I did. But once you are hooked, it is a great reading experience. I am intrigued and am looking forward to reading more of his work. My favorite stories? ‘The thing about Cassandra’, ‘A Calendar of Tales’, ‘The Man who forgot Ray Bradbury’, ‘Jerusalem’, ‘And Weep, Like Alexander’ and ‘In Relig Odhrain’. I am sure you must have already read some of these stories before since this book is a compilation of his previous published as well as new work. Previous PostPrevious The Maltese Falcon….The Mother of Noir Classics! Next PostNext Sorry, Not For Sale….A woman’s undaunted journey!